Our digestive systems are like a disassembly line where food is broken down and nutrients are absorbed into our bodies. Something people may not know is that bacteria is what runs our digestive systems. Friendly bacteria helps our digestive systems to run properly. Some times this friendly bacteria can be overrun by unhealthy bacteria which can wreck havoc on our digestive systems. Our digestive systems will then either run too fast or too slow. If this happens, our bodies can be deprived of the healthy nutrients our body needs. 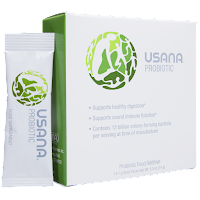 With USANA Probiotic you can provide your digestive system with the friendly bacteria it needs to support digestion and support your immune system. Since about 80% of your Immune cells live in your gut, USANA probiotic helps to support your immune system and strengthen your natural defense systems and prevents toxins from entering your body. USANA's Probiotic delivers 12 Billion units of bacteria within 1 Dose. It contains no sugar, no milk, no refrigeration, and has a shelf life of more than 18 months compared to other probiotics in the market. If you want to support the friendly bacteria living in your digestion system AND support your immune system. Try USANA's probiotic today.